Ever wonder what 20,000 WoW fans look like? Back in December, to celebrate the five-year anniversary of World of Warcraft (and the fifteen-year anniversary of Warcraft as a whole), Blizzard announced the Battle Cry Photo Mosaic, a project that asked thousands of WoW players to take pictures of themselves holding up emblems to display their faction allegiance - Alliance or Horde. The pictures would then be stitched together to form one awesome photo-mosaic featuring the game's ten faction leaders, five per side. Well, guess what: It's done, and it's awesome. The number of people in this image is really impressive, and even more so when you consider the fact that it's but a tiny, tiny fraction of the 11 million that play the game worldwide. Hell, it isn't even as many people as the multitudes that attend BlizzCon. 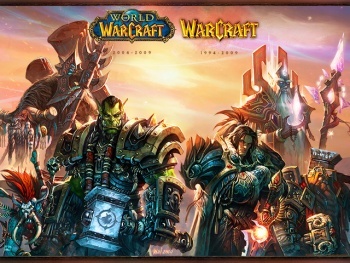 But it's still a really cool picture - both the picture itself and the mosaic - despite Blizzard's obvious and disgusting Horde bias. It's great when a community comes together for something like this, isn't it? To see the full, 14400 x 6150 mosaic, go here, but don't blame me if it kills your computer.